I've just cooked this for myself while tara is out buying a winter coat, in a snow storm, and marni is sleeping soundly like the dove she is. This must be a new fastest record - it took me about 7 mins. 1 min to heat the oil and butter, 2-3 mins each side for the steak, and 1-2 mins for the sauce. - Heat 1 tablespoon olive oil and 2 tablespoons butter in a pan on a high heat. - When hot and foaming, add 4 fillet or sirloin steaks, and cook for 3 mins either side (for medium-rare done). - Add black pepper and remove to a plate. 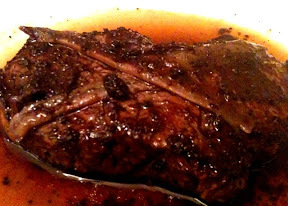 - Criss-cross each steak with 2 anchovy fillets and add halved black olives to the 4 quarters. - Add 4 anchovy fillets to the pan juices, mash up, then add 1 glass red wine and reduce. - Add to the steaks and serve. 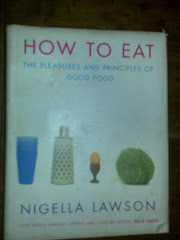 Nigella seems to love olive and anchovies with her steaks and it does seem to work.